Susan Beck (center) is Alabama’s Court Appointed Special Advocate of the Year. She is pictured with Lesley Kubik (right) and Sherry Willis. 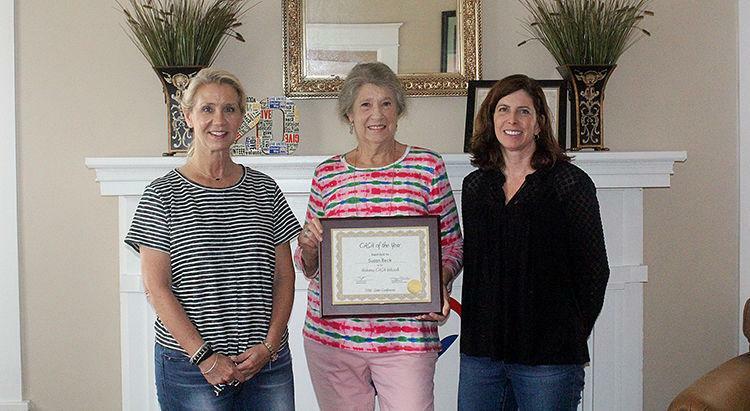 Susan Beck has dedicated the last 20 years of her life volunteering as a Court Appointed Juvenile Advocate with CAJA of Marshall County. At the Alabama Court Appointed Special Advocates (CASA) State Conference she was honored as the 2018 CASA of the Year. Beck lives in Union Grove with her husband, Jim, which she explained is the reason that she is able to give so much of herself to volunteering. Since 1998 Beck has been devoted to making certain that the children of Marshall County have a voice in the Family Court System. Sherry Willis, Volunteer Coordinator for CAJA, expressed great admiration for Beck and her work with CAJA. Beck said that it is not always easy standing up for the abused and neglected children, because everyone involved is having to go through a rough time. She explained that she is understanding toward everyone, but her main focus is the child. Lesley Kubik, CAJA of Marshall County Executive Director, said that Beck is one of the best examples of what a CAJA should be, that she is a great person and that she has great respect for her. Beck said that CAJA of Marshall County needs more volunteers. She explained that there are always more and more children that need help, and that CAJA will be there when they are needed. Visit cajaofmarshall.org or call the CAJA office at 256-878-1445 for more information on how to become a CAJA volunteer.